Over the English Channel, June 12, 1979. 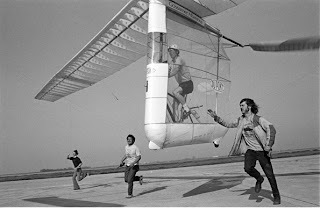 From Wikipedia: The Gossamer Albatross was a human-powered aircraft built by American aeronautical engineer Dr. Paul B. MacCready's AeroVironment. 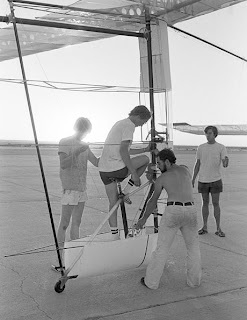 On June 12, 1979 it completed a successful crossing of the English Channel to win the second Kremer prize. 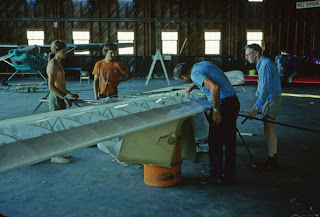 Very interesting Paul MacCready interview here. 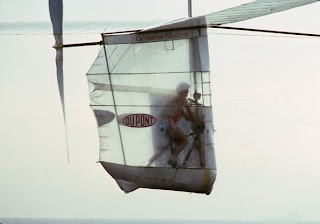 Gossamer Odyssey: The Triumph of Human-Powered Flight by Morton Grosser gives a detailed account of the project. I remember this! Glorious. Thanks for the reminder.